This is the tomb of Ahmad, son of Musa, and brother of Imam Reza (the 8th saint in Shiite Islam-see Mashad). 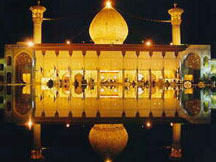 Ahmad was martyred and is buried in Shiraz. Shoes must be taken off before entering and you should dress respectfully. Visiting the shrine gives you serene and peaceful feeling. There is a museum displaying Korans, fine china, old coins and glassware. Postcards and some books in English are available in bookshop.